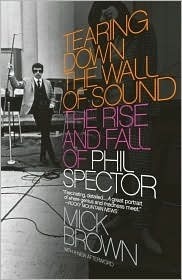 I’ve finally gotten around to reading Mick Brown’s 2007 book, Tearing Down the Wall of Sound: The Rise and Fall of Phil Spector, which delivers the goods for anyone who’s curious about the life and work of rock’s most famous producer. To craft this portrait, Brown talked to more than a hundred of the subject’s buddies, lovers, enemies and associates; he also conducted a long interview with the man himself. The result is a sad story, but also one that I found hard to put down and consistently illuminating. I’ve been writing about and listening to Spector’s music for four decades now, yet I discovered a lot here that I didn’t already know. The book covers the producer’s world in vivid detail, including all his great and not-so-great recording sessions, his marriages, his feuds and his arrest for murder. And though the volume went into production before its subject’s trial began, it incorporates enough evidence to leave little doubt that the guilty verdict fit the facts. Spector comes off as one of the most idiosyncratic and emotionally disturbed characters I’ve read about since Tiny Tim, which is saying plenty. Clearly this is an angry, unhappy, insecure individual whose personal life has been a train wreck. On the other hand, the author does a good job of conveying Spector’s musical genius as well as the side of him that attracted a collection of loyal friends. The book includes eight pages of photos, detailed notes and a bibliography. Curiously, there’s no index but that’s about the only notable flaw I found in this well-reported and well-written tale. Now that I’ve read it, “Be My Baby” and “You’ve Lost That Lovin’ Feeling” will never sound quite the same. It’s the British Invasion All Over Again . . .